Robert S. Hornsby, Sr. began the Hornsby real estate tradition in 1952 with the development of Middletown Farms, the first post-war housing community in Williamsburg. He went on to become one of the most popular real estate developers in southeast Virginia because his subdivision design and construction choices were made to consistently benefit his homeowners and the greater community at large. At Hornsby Real Estate Co., we are inspired daily by his example, and strive to do our business the way Robert would have it done. Obituary of Robert S. Hornsby, Sr.
Robert Stanley Hornsby Sr., 78, of Williamsburg, the patriarch of a prominent Williamsburg family, a retired oil company executive, a leader in real estate development in Williamsburg, and a member of City Council during 1968-76, died Dec. 17, 1998. Robert C. Walker, former mayor who served with Mr. Hornsby on council, said, "He was one of the old Williamsburg group who welcomed me when I came here in 1954. He was a developer of communities, and he had vision and good taste. The communities he developed were well-done and very attractive, and he worked at making them attractive before local laws and regulations were in force. "He was very kind and did good things for those who were less fortunate. He was friendly and jovial when the occasion required, and in business, he was forthright, practical, and made suggestions that hadn't been thought of by anyone else. Williamsburg has lost a great leader." Mr. Hornsby graduated from the College of William & Mary in 1941 and received his juris doctorate in 1949. He served during 1979-83 on the Board of Visitors at the college and was a former president of the Alumni Society and the Alumni Interfraternity Council. Dr. Thomas Graves, former W&M president, said, "Bob and Lois Hornsby were the first family we met when we came to Williamsburg in 1971. I've never known a man more devoted to his community and the College of William and Mary than Bob Hornsby. "During his years on the Board of Visitors, he provided thoughtful, careful, and enormously supportive leadership to both the college and to me," Graves continued. "Williamsburg is going to miss Bob. My wife, Zoe, and I remember him with great affection and deep respect." In 1970, Mr. Hornsby was awarded the Alumni Medallion of the Society of the Alumni of the College of William & Mary, for "service and loyalty." James Kelly, assistant to the president, said, "Bob Hornsby was a kind and thoughtful individual who possessed the ability to make everyone feel important. He worked hard for his community and successfully filled many leadership roles at the college. Bob was ambitious for this community, and his vision was always an inspiration to those who worked with him." After receiving his law degree, Mr. Hornsby decided to go into business with his father, in the management of the Hornsby Oil Co. Robert Hornsby subsequently became president of Hornsby Oil in 1952 and then branched into real estate development. Mr. Hornsby was the developer of Middletown Farms, Kingswood and Windsor Forest subdivisions and served as president of Heritage Development Co., Heritage Realty Co. and Middle Plantation Holding Co. He was president of Charter L.L.C., the developer of Westmoreland subdivision, and vice president of Hornsby Real Estate Co.
Larry McCardle, a friend and colleague, said, "The highest compliment anyone could ever pay me would be to say that I did business the way Bob Hornsby did. He welcomed me into the real estate business and was always happy to offer advice or assist with a problem. "He was a great inspiration to me," added McCardle, "and I tried to conduct my business as Bob conducted his. He was a man of honesty, integrity and of solid moral fiber. He'll be greatly missed by all who knew and loved him. Mr. Hornsby was a past president and member of the board of directors of the Peninsula Chamber of Commerce, a member of the board of directors and Advisory Committee of the Virginia Peninsula Economic Development Council, and past president of the Virginia Petroleum Jobbers Association. He was also a member of the board of directors of Crestar Bank, the Williamsburg Chamber of Commerce, and the Rotary Club. "He was very conscientious, very honest, and attempted to do a good job for the citizens of Williamsburg," said Frank Force, former Williamsburg city manager and a fellow Rotarian. "His father J.W. Hornsby became a charter member of the Rotary Club in 1924, Bob was on the Rotary, and now his son Bobby is also - three generations of Rotarians." Mr. Hornsby was a founding member of the Board of Trustees at Williamsburg Community Hospital, past president of Williamsburg-James City United Way, co-chairman of the Williamsburg Recreation Association Fund Drive, and past president of the Golden Horseshoe Club. "I've known Bob for 40-some years," said Phil Richardson, a friend and business associate. "We owned property together at different times, and he was just a wonderful person. He was always upbeat, always humorous, and he was a leader in the community." J. W. Hornsby, Robert's father, was a waterman who had gotten into the fuel oil distributorship business and thus built the family's wealth. Regardless, J. W. and his wife, Georgie, instilled in their children a belief in hard work, religion, the importance of investing wisely, and the need for brotherly love. 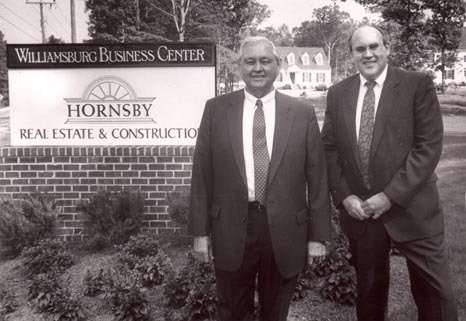 In 1991 the Williamsburg Area Chamber of Commerce honored the Hornsby family for its efforts on behalf of area business, industry, education and community pursuits. In a Gazette article about the tribute, Robert Hornsby remarked that his father had "... passed on his belief in helping not only our immediate family but the family of man, as well." Robert Hornsby was born in Seaford and grew up in a family that had two favorite pastimes: sports and music. The family enjoyed all kinds of sports - fishing, boating, hunting, baseball, golf - and played musical instruments and sang. The Hornsbys often spent hours harmonizing around the dining room table after supper. New Year's Eve 1935 was a memorable evening for the family. Robert and his brothers, Sherwood and Charles, performed as "Sherwood Hornsby and his Rhythm Boys" at Topping's Court, Williamsburg's first motel. Robert played sax, Sherwood was on the piano, and Charles played the clarinet. Robert Hornsby was just 14. He continued his love of music throughout his years at W&M, playing in the college orchestra and in a dance band. Howard Smith, a longtime friend, recalled, "We played in the same dance band at the college. We had a 14-piece band, and he played the saxophone. He was a tremendous friend." Mr. Hornsby also continued his interest in sports, playing on the W&M football and golf teams and serving as captain of the golf team in 1941. In 1980, he was selected to the W&M Sports Hall of Fame. Mr. Hornsby's education was interrupted during World War II. He served as a Navy lieutenant on heavy cruisers in the Atlantic and Pacific theaters and also served a stint as head of the Navigation Department, University of Illinois ROTC. After the war, he returned to his studies at W&M and there met Lois Saunier, a native of Richmond at a Homecoming dance. The couple was married in 1948 and settled in Williamsburg. Earl Levitt, a former neighbor, chuckled, "I used to listen to his children rehearse their music. The walls would go in and out on Saturday and Sunday afternoons." He added, "Bob was always quite pleasant and easy to get along with." Mr. Hornsby is survived by his wife of 50 years, Lois Saunier Hornsby; three sons, Robert Saunier Hornsby and his wife, Ann, of Williamsburg, Bruce Randall Hornsby and his wife, Kathy, of Williamsburg, and Jonathan Bigelow Hornsby and his wife Paige, of Charlottesville; and seven grandchildren. In lieu of flowers or other considerations, memorial contributions may be made to the Williamsburg Land Conservancy, PO Box 2000, Williamsburg, 23187. Thank you for visiting Hornsby Real Estate Co. in Williamsburg, Virginia. Please visit our site often for information on homes, commercial property, raw land, waterfront homes & land, or any other Williamsburg real estate question. For over 20 years, Bobby Hornsby has worked as a Realtor, Builder, and Appraiser. His knowledge as a 45 year Williamsburg area resident gives him a hands on history with much of the area property, including land, homes, and waterfront property. Come home to Williamsburg, Virginia, and Call Hornsby Real Estate First to get the information you need. Information is considered accurate but not warranted, and all prices, specifications, data and property are subject to change without notice, and subject to prior sale.